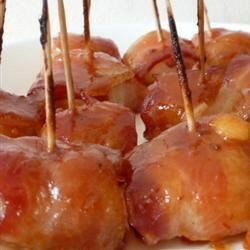 "A tangy version of bacon wrapped chestnuts." Cut each strip of bacon in half. Wrap one strip around one water chestnut. Secure with a wooden toothpick. Place in shallow baking dish. While the wraps are baking, in a small mixing bowl combine brown sugar, mayonnaise, and chili sauce to make barbecue sauce. After the wraps have finished baking, transfer them (removing them from the grease) to a second shallow baking dish. Pour the sauce over the wraps. Bake at 350 degrees F (175 degrees C) for 10 to 15 additional minutes, or until bacon is crispy. Serve hot out of dish with toothpicks. I just tried this in a cooking class and our instructor suggested using Miracle Whip to give it that tangy flavor. Yummy!! This is a great appetizer. Instead of chili sauce, I used a bit of tobasco...really added that extra kick! I have used this over and over again...always the first to go!